There’s no link between the amount of solar power a state uses and falling carbon dioxide (CO2) emissions, according to statistical analysis conducted by The Daily Caller News Foundation. TheDCNF analyzed 2013 data from the Energy Information Administration (EIA) on CO2 emissions within the energy sector, the last year for which data on states is available. It also analyzed EIA state solar data from 2014, and the results show that those states haven’t reduced emissions much. Finally, TheDCNF displayed the data on the maps below. The DCNF’s analysis found that a majority of U.S. states, especially eastern states, saw CO2 emissions fall by at least 10 percent. America’s overall CO2 emissions have fallen by 12 percent since their peak in 2000, according to the EIA. Across America, CO2 emissions are at their lowest levels in decades. The U.S. has reduced greenhouse gas emissions more than any other country, a fact even The Sierra Club acknowledges. 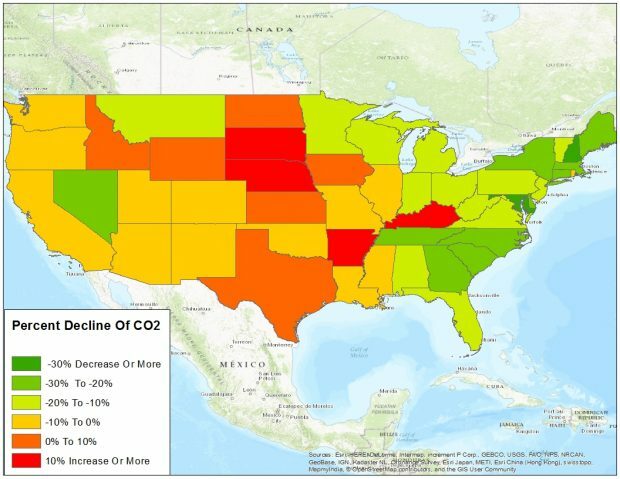 TheDCNF’s analysis found that, since 2005, states like New Hampshire, Maryland, Maine, Georgia, Nevada and Alaska saw the biggest reductions in CO2 on a percentage basis than any other states. 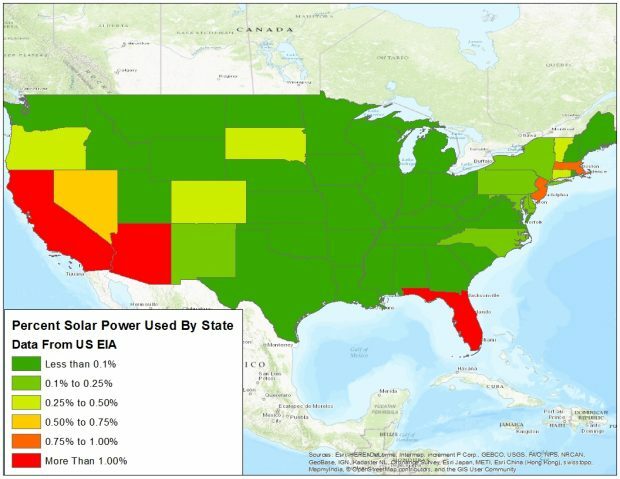 Of those states, only Nevada derived more of its electricity from solar power than the average. TheDCNF found that solar power generation is concentrated in only a handful of states, none of which have significantly reduced their CO2 emissions. Statistical analysis supported this conclusion, and found nothing even close to a statistically significant correlation between reliance on solar power and falling CO2 emissions. Previous DCNF analysis found a statistically significant link existed between a state’s CO2 emissions and its economic dependence on hydraulic fracturing, or “fracking.” This analysis revealed a 95 percent chance of a positive correlation. For clairification, there is a 95 percent chance the correlation between the two items is not random. Scientists accept a possible link on this basis. The use of comparatively older data predates hydraulic fracturing indicating that new results will possibly reflect even stronger link. Fracking does more to reduce CO2 emissions than solar or wind power, according to a study published last November by the Manhattan Institute. The study shows that solar power is responsible for a mere 1 percent of the decline in American CO2 emissions, while natural gas is responsible for nearly 20 percent of the decline. For every ton of CO2 cut by solar power, fracking has cut 13 tons.